Klear Screen works on LCDs, plasma screens, MP3 players, camera lenses, CDs and DVDs and keyboards too - Safe and effective on virtually all screen surfaces, including those with anti-reflective coatings - Laptop not included. Klear Screen's anti-static, alcohol- and ammonia-free formula is safe to use on all your LCD screens, including laptops, smart phones, e-readers, tablets, even your car's GPS display. 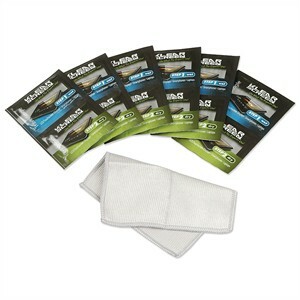 Each travel single includes a wet cleaning cloth for smudge removal and a dry polishing cloth. The package includes 12 Klear Screen travel singles and a dual micro textured (DMT) antimicrobial microfiber cloth.